A&M Architecture students launch hospital design collaboration with fact-finding trip to Boca Raton, Fla. Architecture professor Rodney Hill will soon be tooling around campus on a brand new Segway, the unique two-wheel “Personal Transporter,” which along with a $2,000 stipend, he earned as recipient of the 2006 - 2007 Texas A&M University Honors Program Teacher/Scholar Award. “The Teacher/Scholar Award Committee that selected Rodney was astonished at the sheer number of honors students whom Rodney had taught in formal classes and whom he had inspired with his out-of-class activities,” said Kurt Ritter, associate director of the Office of the Honors Program. The $2,000 stipend that comes with the award can be used for any purpose that enhances the teacher/scholar’s research or teaching. The Segway is for fun. 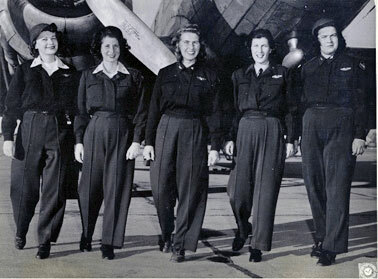 Women Air Force Service Pilots were among those stationed at Bryan Army Air Force Base, which is today the site of the Texas A&M Riverside Campus. During the Friday sessions of the Historical Preservation Symposium, participants will tour structures remaining from the Army air base days. “Conserving Texas’ World War II Heritage” is the focus of the Eighth Annual Historic Preservation Symposium, a two-day event sponsored by the Center for Heritage Conservation at the Texas A&M College of Architecture. The symposium will be held 8:30 a.m. – 4:30 p.m. Friday, March 2 at the College of Architecture’s Built Environment Teaching and Research Facility, or “Architecture Ranch,” the Texas A&M Riverside campus. On Saturday, the symposium moves to the Preston Geren Auditorium at the Langford Architecture Center on the university’s main campus. Saturday’s session is 8 a.m. – 4:30 p.m. The two-day symposium will “further the education and practice of heritage conservation, and will illustrate where preservation practice is today and where it will proceed in the future,” said David Woodcock, professor of architecture at Texas A&M and director of the College of Architecture’s Center for Heritage Conservation. 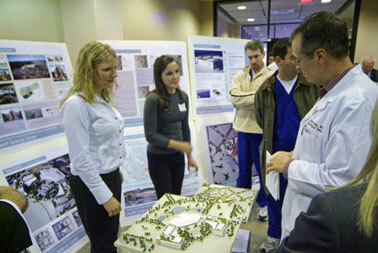 Healthcare architecture s tudents unveil designs last fall for proposed Health Science Center on the Texas A&M campus. The internationally renowned healthcare architecture and planning initiative at Texas A&M University’s College of Architecture just turned 40 years old, and the college’s Center for Health Systems & Design (CHSD) will mark the occasion with a celebration in San Antonio on Monday, Feb. 26, in conjunction with the International Conference and Exhibition on Health Facility Planning, Design and Construction (PDC). The Texas A&M architecture program’s focus on healthcare design began in 1967 when Professor George J. Mann introduced what has been described as an especially adept studio to the emerging architectural specialization. In the four decades since, the Texas A&M architecture program has produced a whole new generation of highly nuanced architects who specialize in designing smart, high-tech healthcare facilities that nurture patient recovery while facilitating the numerous, ever-changing demands of modern medicine. Students and faculty from the Texas A&M University’s College of Architecture are cooperating with an international architecture and construction firm, HKS, Inc, to develop innovative, “evidence-based design” solutions for a new hospital in Boca Raton, Fla. The 37 students, from three separate College of Architecture design studios, traveled to Florida in earlier this month to begin research for their designs proposals. Leading the combined Texas A&M effort are co-project directors George J. Mann, holder of the Skaggs-Sprague Endowed Chair in Health Facilities Design; Susan Rodiek, Ronald L. Skaggs Endowed Professor of Health Facilities Design; Joseph J. McGraw, architecture professor emeritus; and Kirk Hamilton, associate professor of architecture and interim director of the Center for Health Systems and Design. Michael Neuman, professor of urban planning at the Texas A&M College of Architecture, received a two-year, $124,830 grant from the National Science Foundation to build a “multi-factor performance assessment model” for gauging metropolitan cities’ authoritative performances within large government-funded institutions. Neuman, working with Franziska Hasselman, a scientist with the Swiss Federal Research Institute WSL, will measure the effectiveness of city management and institutional design, looking for new ways to control problematic factors such as pollution, public health, and global warming. Neuman said the model will ultimately help lawmakers and other decision makers develop better strategies for improving infrastructure provision. Students in the Department of Construction Science who want to broaden their horizons by studying abroad may be eligible for a new scholarship. 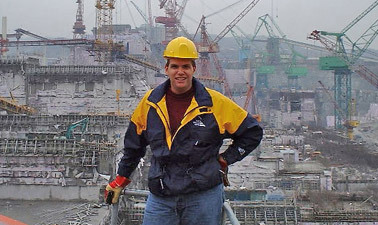 With a $25,000 gift to the Department of Construction Science, former students Greg Childers and Mike Webb, with matching funds from the Halliburton Foundation, have endowed the Global Construction Excellence Fund, which benefits full-time students interested in studying abroad or other international experiences, such as international internships. Fourteen students from Texas A&M University’s College of Architecture presented their research and design concepts for a new sustainable homeless shelter for Bryan’s Twin City Mission on Feb. 21 at Texas A&M System’s John Connally Office Building. George Mann, architecture professor and holder of the Skaggs-Sprague Endowed Chair in Health Facilities Design and co-adviser for the project, noted that the project was designed to expose the architectural students to the process and experience of working with actual clients on a real project and on a real site. 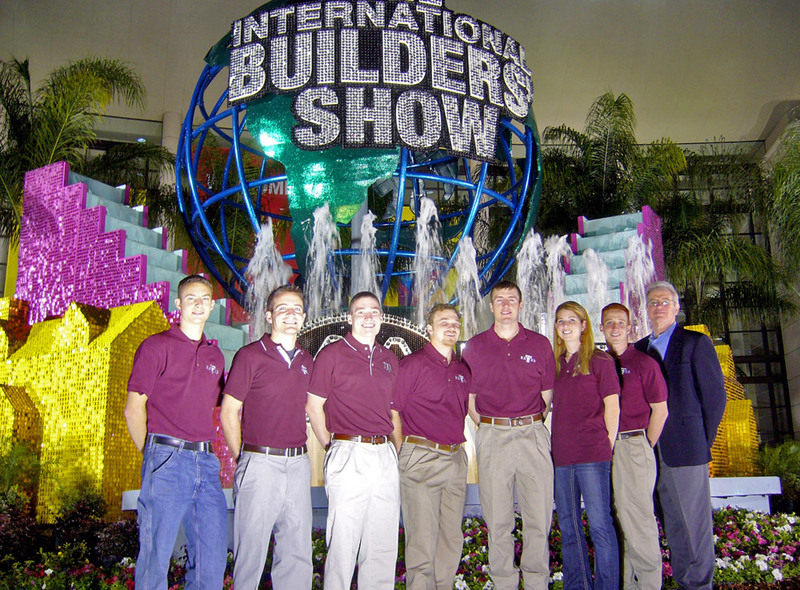 The Texas A&M construction science team placed fourth among the 45 teams participating in the National Association of Homebuilders (NAHB) Residential Construction Competition held Feb. 7 – 9 at the International Builders Show in Orlando, Fla. The competition involved putting together a feasibility plan to develop a residential condominium project, consisting of 102 condominiums, in Fairfax, Va. The student teams’ written proposal included a cost estimate, finance and management plan, construction schedule, market analysis and a marketing strategy. 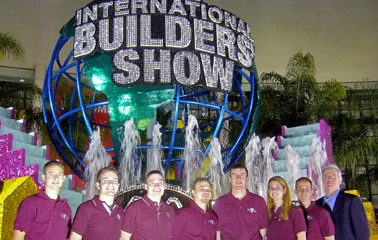 The teams presented their projects during the builders show. Also at the competition, the Texas A&M NAHB Student Chapter placed second nationally in the Student Chapter of the Year competition. The competition is based on the past year’s activities, where each chapter from a national university submits a compilation for review. Architecture graduate student Igor Kraguljac (pictured above) traveled to Fort Collins, Colorado, to exhibit his photographic images at an art gallery there. 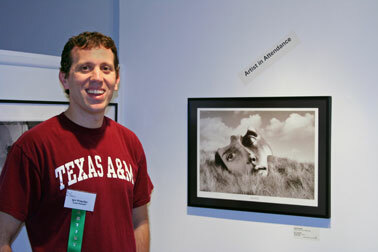 Kraguljac's trip was underwritten by the College of Architecture, and he expressed his gratitude for their support by wearing a Texas A&M t-shirt throughout his visit to the gallery. Kraguljac's work was featured at the juried Fantasy and Fantasies exhibition at the Center of Fine Art Photography in Fort Collins from Jan. 12 through Feb. 17. In addition to the gallery exhibit, his work has been selected for a special exhibit at the Denver airport. The Center for Fine Art Photography is a non-profit organization whose mission is to showcase the work of leading and emerging photographers and to educate the public about the collectible value of photographic art. The juror for the Fantasy and Fantasies show is Grace Norman, the center's exhibitions director. Forty-nine photographers from Italy, Israel, Romania, Great Britain, Canada, Ireland and the United States were chosen to display their work at the show. A semester's worth of work is captured for posterity. Texas A&M architecture professors Rodney Hill, winner of the 2006 David Tanner Champion of Creativity Award, and Jorge Vanegas, director of the Center for Urban Housing and Development, served as panel members for Feb. 14 Seminar for Creativity and Research. The event, designed to help faculty and advanced graduate students learn to apply creative strategies to their research, was was co-sponsored by the Office of the Dean of Faculties and the Office of the Vice President for Research. The panel of multi-disciplinary faculty with expertise in creativity offered seminar participants tools to generate ideas for proposals and to formulate strategies for overcoming difficulties throughout the research process. A discussion examining aspects of informal scientific partnerships, led by Charles Walters, CEO of the Fort Worth Museum of Science and History, will be held 2 - 3 p.m. on Thursday, Feb. 22 in Rudder Tower Room 601. Walters will lead faculty interested in starting proposals to national funding programs in a Q&A session, focusing particularly on NASA research opportunities in earth and space sciences, NSF Career grants, NASA Young Investigator awards, NSF Engineering Research Centers, and NSF Science and Technology Centers. New faculty members interested in writing career development proposals are invited to stay an extra hour for an extended discussion. Topics will include the basic elements of informal science, its role within research projects and how to get started. To register, send an e-mail to opd@tamu.edu with subject line: "Informal Science." The College of Architecture continues to offer a matching gift program that doubles faculty and staff philanthropic contributions to the college up to $500. All non-scholarship gifts given before April 15, 2007 will be matched with college funds made available from a development fee levied by the Texas A&M Foundation on the many generous donations received by the college in 2006 as part of the One Spirit One Vision development campaign. Though contributions supporting any college program or special interest are welcome, donors are asked to consider supporting new endowments that are not yet fully funded. The college’s development staff, Larry Zuber and Trish Pannell, are ready to advise anyone interested in directing a gift to a specific area. For more information or to donate, contact Larry Zuber, director of development, at 845.0939 or l-zuber@tamu.edu, or Trish Pannell, development and promotion coordinator, at 458.0400 or t-pannell@tamu.edu. The Center for Teaching Excellence at Texas A&M University has a spring 2006 agenda chock-full of special events, workshops, weekend long conferences, information sessions and forums, all aimed at enhancing participants’ teaching skills. 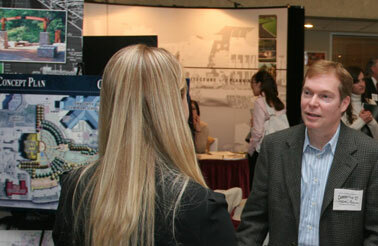 Landscape architecture and planning students had an opportunity to network with professionals at the department's recent Career Fair. 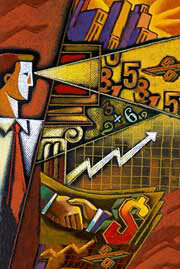 A record number of firms were vying for new talent. The American Council of Construction Education's mid-year conference will be held in Charleston, South Carolina. For more information, contact Ann Eastwood at 845.0289 or aeastwood@tamu.edu. Associated General Contractors Conference (AGC) will be held in San Antonio, Texas. 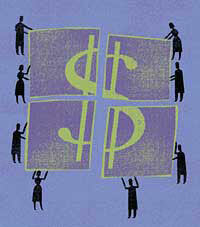 For more information, visit the AGC Web site: http://www.agc.org/page.ww? COSC Teaching Academy: This department-sponsored workshop on teaching will be held 2:30 – 5 p.m. in Langford C 207. For more information, contact Anne Eastwood at aeastwood@tamu.edu. COSC Scholarship and Awards Banquet will be held 5 – 11 p.m. at the College Station Hilton. For more information, contact Anne Eastwood at 845.0289 or aeastwood@tamu.edu. The Construction Industry Advisory Council meets 1 – 5 p.m. on Thursday, March 29, and 9 a.m. – 1 p.m. on Friday, March 30. Both meetings will be held in Rudder Tower 601. For more information, contact Ann Eastwood at 845.0289 or aeastwood@tamu.edu. 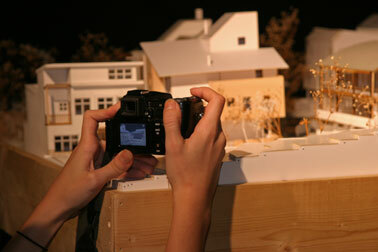 International Sustainable Urbanism Workshop will be held from 8 a.m. – 5 p.m. in the MSC. The topic will be “Redefining Sustainability in Urban Regions.” Speakers currently confirmed include Phillip Cooke, from the Centre for Advanced Studies at Cardiff University, Wales; Dushko Bogunovich, from the University of Technology (Unitec), Auckland, New Zealand; Phillip Berke, from the University of North Carolina, Chapel Hill; Mark Holtzapple, from Texas A&M University, College Station; Uta Birkmayer, of XSense Experiential Design, San Louis Obispo, California; and Pliny Fisk, Texas A&M University, College Station. This event is sponsored by the Department of Landscape Architecture and Urban Planning’s Center for Housing and Urban Development. Details on the conference are available online at http://sustainableurbanism.tamu.edu. For more information, contact Dolores Gonzales at 458.0102 or dgonzales@archone.tamu.edu. “Baithak” Indian Music Concert: The Society for Promotion of Indian Classical Music and Culture Amongst Youth (SPICMACAY) presents “Baithak,” a gathering of artists, including Texas A&M faculty and student vocalists, musicians and dancers, performing classical Indian music, 3:30 – 10 p.m. in the Preston Geren Auditorium and Langford B Exhibit Hall at the College of Architecture. For more information, contact Pudhuma Karunakaran at 510.457.5553 or pudhuma@gmail.com. Dollhouse Build Day: Construction science students will be construct custom dollhouses 9 a.m. - 3 p.m. at the College of Architecture’s Architecture Ranch at the Texas A&M Riverside Campus. The homes will later be sold as part of a fund-raising activity. For more information, contact Ann Eastwood at 845.0289 or aeastwood@archone.tamu.edu. This event was recently rescheduled from April 26 – 27 to April 10! Details, including the speaker line-up and new meeting location will soon be announced. 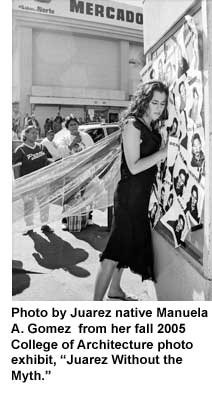 The event, presented by the Interdisciplinary Texas A&M Scholars Consortium on Border Research and sponsored by the Center for Housing and Urban Development (CHUD), will focus on gender violence on the U.S. – Mexico border. For more information, contact Jorge Vanegas, CHUD director, at 845.7070 or chud-director@tamu.edu. 6th Annual Evening of the Arts, sponsored by the Women and Gender Equity Office and the Health and Kinesiology Department, is the last event of Gay Awareness Week. This year, the Dance Production class will host the featured artists. The event will take place in the Preston Geren Auditorium and the Langford B Exhibit Hall 7:30 – 9:30 p.m. For more information, contact Chelsi West at 979.224.0143 or chelsnicole@tamu.edu. “Light Celebrating Place,” Jill Mullholland’s dissertation video, will be shown 5:30 – 6:30 p.m. in the Preston Geren Auditorium. The premise of Mullholland’s research is that light and place work together in such a closely-knit relationship, neither could exist without the other. In 2005, Mullholland received a $20,000 grant from the Nuckolls Fund for Lighting Education in order to build and document her dissertation. For more information, contact Jill Mullholland at 779.7373 or jill.mullholland@gmail.com. SWAMP Screening: The Aggie SWAMP (Screenwriters, Actors, Movie Producers) Club will have an end-of-year screening for member-created movies. The screening will take place in the Preston Geren Auditorium from 6:30-10:30 p.m. For more information, contact Carol LaFayette at 845-3465 or lurleen@viz.tamu.edu. College hosts AIA Convention reception: The Texas A&M College of Architecture will host a reception at the AIA National Convention in San Antonio, Texas 7 – 9 p.m. at a location to be announced. For more information, contact Melinda Randle at 847.8918 or mrandle@archone.tamu.edu. 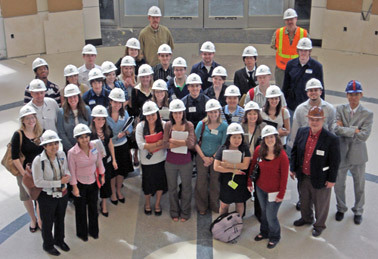 Construction Science Grads honored: A graduation reception for construction science graduates will be held 5 – 8 p.m. in the Langford A Atrium. For more information, contact Ann Eastwood at 845.0289 or aeastwood@tamu.edu. ACADIA conference: The Association for Computer Aided Design in Architecture’s international conference will be held in Halifax, Nova Scotia, Canada. 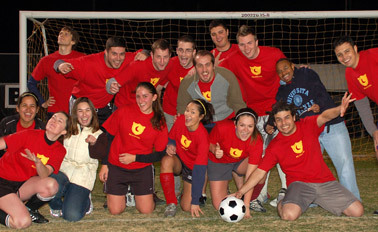 For more information, visit the ACADIA Web site at http://www.acadia.org/. Outstanding Alumni Awards Banquet: The College of Architectures annual Outstanding Alumni Awards will be presented 6:30 – 10 p.m. at the Miramont Country Club. For more information, contact Trish Pannell at 458.0400 or t-pannell@tamu.edu. Kevin Sample, Daniel Romo, Jonathan Johnson, Dave Morris, Hernan Molina, Danny Berger, Dan Fletcher, Brandon Hepburn and Jorge Martinez. 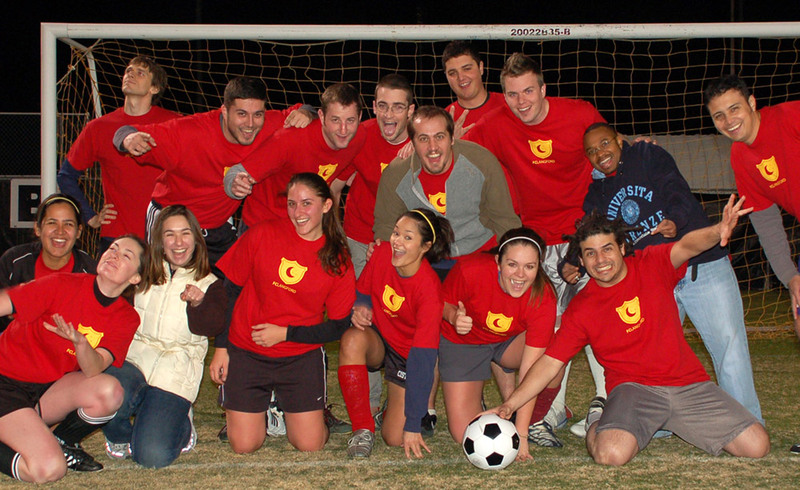 Kneeling (L to R): Mara Salas, Ashley Dias, Regina Stamatiou, Katrina Cobb, Jennifer Wong, Christina Stehling and Alejandro Iriarte.